The injection transformer is presently the prevalent method for connecting the network analyzer to the circuit being tested, and is primarily used for control loop stability measurements. The goal of the transformer is to inject a signal into the control loop being measured, without impacting the performance of the loop. In order to accomplish this to a reasonable degree, The transformer is isolated and therefore is capable of floating on a high voltage, such as a Power Factor Corrector (PFC), which is often close to 400VDC. Measuring voltages that exceed the voltage rating of the Bode-100 inputs require attenuation probes. The usable bandwidth of an injection transformer is generally significantly greater than the 3dB frequency limits. This is because the transformer itself is outside of the measurement, leading many to incorrectly believe that the transformer is a non-critical element. The bandwidth of the transformer is strongly related to the terminating impedance. 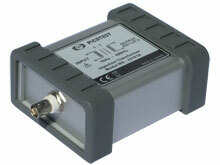 The Bode-100, and most network analyzers, provide a 50 Ohm oscillator source impedance. Assuming this impedance the optimal termination resistor is 5 Ohms. This significantly attenuates the injection signal, which is generally beneficial, as a common error in Bode measurements is using a signal which is too large, and therefore not a small signal measurement. An added benefit of this low value is that it can generally be left in circuit at all times, simplifying the connection to the network analyzer without appreciably impacting the output voltage of the circuit being tested.